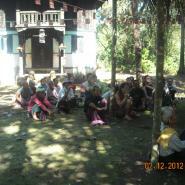 This report includes a situation update submitted to KHRG in December 2012 by a community member describing events occurring in Hpa-an District, including a meeting that took place on December 7th 2012 on the grounds of the M--- village monastery in Noh Kay village tract, T'Nay Hsah Township. 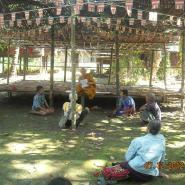 During this meeting, attended by 41 villagers from P---, A---, W--- and M--- villages, a monk presented a document with four rules regulating relations between Buddhist and Muslim villagers, which prohibit Buddhists from selling land to Muslims, prohibit Buddhist women from marrying Muslims and require Buddhists to buy goods from Buddhist shops only. Furthermore, the document states that those who do not follow the rules will be "punished effectively"; a photo of the document is included below. Information in this report suggests that the events described are seen by villagers as connected to events in Rakhine State, given the dissemination of a CD containing footage from Rakhine State amongst local villages prior to the rules being released. 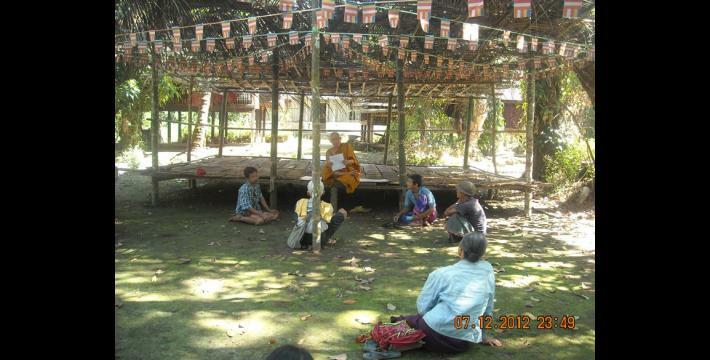 Further, the community member suggests that such meetings have taken place in other villages and townships, and that the relationship between Buddhist and Muslim villagers has deteriorated, with a reduction in trade and communication between the groups. 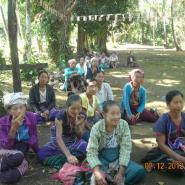 A different KHRG community member also described the dissemination of similar documents by a monastery to Border Guard Force soldiers and local monks in K'Ter Tee village, Papun District; see "Papun Situation Update: Bu Tho and Dwe Lo Townships, September to December 2012," KHRG, March 2013. 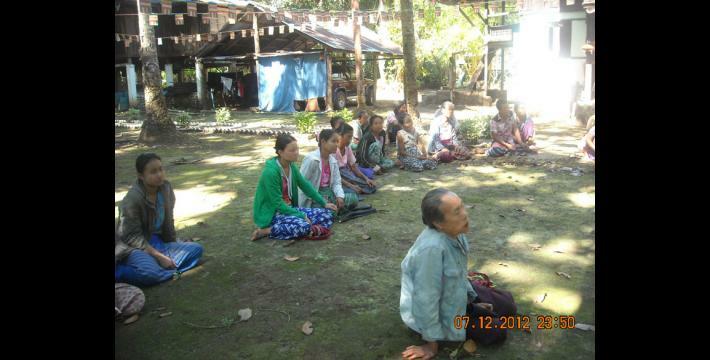 The following situation update was written by a community member in Hpa-an District who has been trained by KHRG to monitor human rights conditions. It is presented below translated exactly as originally written, save for minor edits for clarity and security. 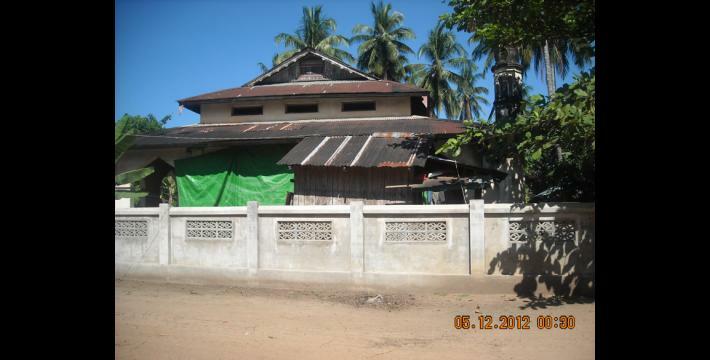 This report was received along with other information from Hpa-an District, including 16 interviews, one other situation update and 155 photographs. 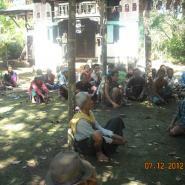 I went to T--- village, Htee Hpoh T'Ray village tract, Ta Kreh Township and I met with Muslim villagers: one medic and two villagers. Before I met with them, I heard the villagers saying to each other that they could not go and buy things from the Muslim [owned] shop. [They said]," If we go and buy [from shops owned by Muslims], and if people see us, they will ask [fine] us 100,000 kyat (US $115.94)." When I went and met with four Muslims on December 5th 2012, I took photos of the Muslims, the mosque, the village street, and I took photos when they were travelling within the village. When I asked them how it happened [the prohibitions on relations with Muslims], they told me about the things that happened in Rakhine State, concerning Buddhist and Muslim people torturing [tormenting] each other. 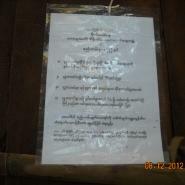 The villagers saw it [footage from Rakhine State] on a CD, which was released, and [then] the monk published an order letter including four points. They [the Muslim villagers] copied it [the order letter] secretly and gave it to me. On December 6th 2012, when I arrived in N--- village, Ka Lah Kon village tract, T'Nay Hsah Township, I met with a Muslim medic and I interviewed him about the related issues. 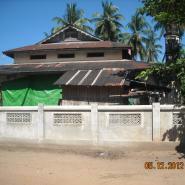 I did not take their photos, but I also interviewed a Muslim man whose name is Maung S---, 32 years old. When I interviewed him, he seemed like he was afraid of [something]. 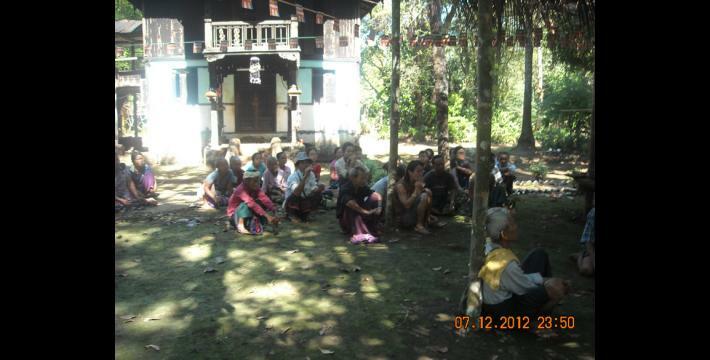 On December 7th 2012, I arrived back to Noh Kay village tract and the monks called the four villages to [attend] a meeting in M--- Monastery compound, and the villages are P--- village, A--- village, W--- village and M--- village. 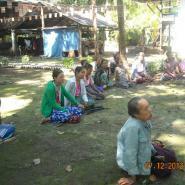 I saw that there were 41 villagers in attendance at the meeting and they held the meeting under the roof. There was only one monk and he took out the order letter that includes the four points. 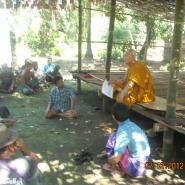 When they [the villagers and the monk] met, they discussed the four points in the meeting. The photos that I have taken are of the order letter that the big [powerful] monk released, and the meeting took 37 minutes. 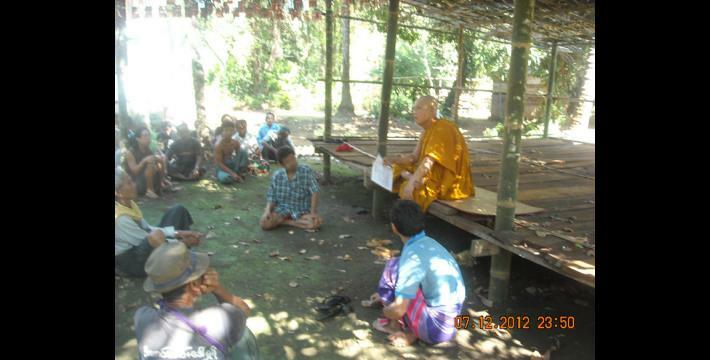 When the meeting ended, and when the villagers came back, I asked some villagers secretly regarding their opinion on the order letter, and they said that: "People will ask us to fight against each other again; in the past, the Baptists and the Buddhists, now, the Muslims and the Buddhists." I see that now, the monks have already had meetings in nearly all of the village tracts, in the villages and in the townships. I see that there is no hurting [violence] yet, but trading among each group has reduced, to only one third [of what it was before]. Their communication has also decreased compared with in the past. Four Rules of the "Group for Maintaining and Protecting the Mission of Different religious sects"
1. Prohibition of Buddhists from selling, renting or pawning their houses, farms and lands to Muslims. 2. Prohibition of Buddhist women from marriage with Muslims. 3. Buddhists should patronize the Buddhist shops only. 4. Prohibition of Buddhists from using their names for the buying or renting of Buddhist owned houses, land, farming land, or orchard land to Muslims. In order to increase the transparency of KHRG methodology and more directly communicate the experiences and perspectives of villagers in eastern Burma, KHRG aims to make all field information received available on the KHRG website once it has been processed and translated, subject only to security considerations. As companion to this, a redesigned website will be released in 2013. 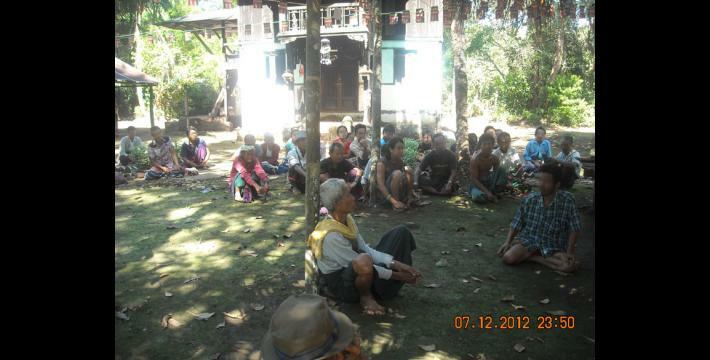 In the meantime, KHRG's most recently-published field information from Hpa-an District can be found in the report, "Demands for soldier salaries in Hpa-an District, October 2012," KHRG, February 2013. As of March 6th 2013, all conversion estimates for the kyat in this report are based on the official market rate of 862 kyat to the US $1. This reflects new measures taken by Burma's central bank on April 2nd 2012 to initiate a managed float of the kyat, thus replacing the previous fixed rate of 6.5 kyat to US $1. 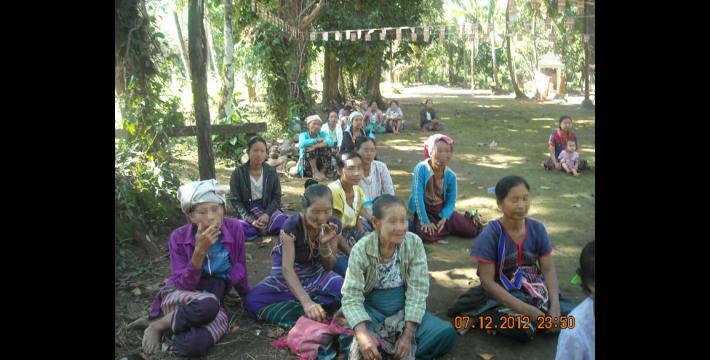 Here the community member is referring to ongoing tension and violence erupting as of June 2012 primarily between Rakhine Buddhist and Rohingya Muslim communities in Rakhine state. 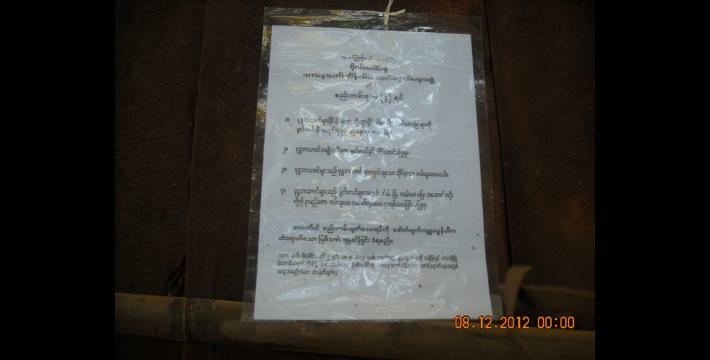 This description of the rules was written by a community member trained by KHRG in Hpa-an District, while KHRG office staff wrote the translation included with the photo of the four rules.